The first batch of US-built heavy-lift Chinook helicopters and Apache attack helicopters will commence arriving India in March 2019, just ahead of the general elections. Both these will be game changers for the military�s capability. In fact, the first of Chinook helicopters are already bound for Gujarat from US defence contractor Boeing in containers and expected to arrive in within this month. These will be reassembled by the contractor, flight tested and then handed over to the IAF. After a three-year delay (the contract having been finalised by India in September 2015), India and US signed a nearly USD 3 billion deal for purchase of 15 Chinook heavy lift and 22 Apache attack helicopters on July 14, 2018. Chosen as winner in October 2012, Boeing had to extend its commercial bid 13 times before being cleared – any further delay would have pushed price of the deal by another USD 1.1 billion. Both these helicopters have been employed in active operations in Afghanistan. The contract had a clause to place follow on orders for 11 more Apache and seven extra Chinooks. Purchase of six additional Apaches already stands approved by the US administration. The Chinook deal is directly with the US firm Boeing while the deal for Apache is hybrid; for the helicopter with Boeing and for its weapons and electronic warfare suites with the US Government through the Foreign Military Sales (FMS) route. The overall contract has a 30% offset clause, which will bring in business worth about USD 600-800 million for the indigenous defence industry. 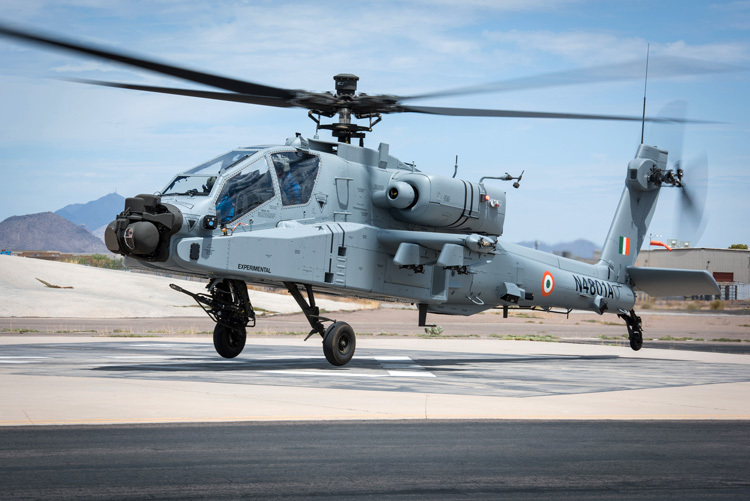 Boeing carried out the first flights of the Apache and Chinook helicopters and delivery to the Indian Military on July 27, 2018. Chinook is a multi-role, vertical-lift platform, which is used to transport troops, artillery equipment, fuel, and in humanitarian and disaster relief operations for transportation of relief supplies and evacuation of persons affected by disaster. With a payload of 10,886 kg and maximum takeoff weight of 22,680 kg, Chinook can transport 30-35 troops, fly at speeds of 296-315 kmph to a radius of 370 km at service ceiling of 20,000 feet. Its armament includes up to three pintle-mounted medium machine guns – one on loading ramp and two at shoulder windows. Chinooks are presently in service of armed forces of Australia, Canada, Republic of China (Taiwan), Egypt, Iran, Italy, Japan, South Korea, Morocco, Netherlands, Saudi Arabia, Singapore, Spain, Thailand, Turkey, UAE, UK and the US. The Chinook helicopters are planned to be stationed at Chandigarh air base, which supplies the Siachen and Eastern Ladakh sectors. Possibly, some may also be located in the northeast. The Apache AH-64D Longbow helicopters are one of the most advanced multi-role combat helicopters, with all-weather and night fighting capability and ability to track 128 targets in less than a minute and engage 16 targets at once, an attack can be initiated within 30 seconds. The Apache also has stealth characteristics, advanced sensors and beyond visual range (BVR) Hellfire missiles and rockets. A radio modem integrated with the sensor suite allows data to be shared with ground units and other Apaches, allowing them to fire on targets detected by a single helicopter. The Apache attack helicopters are in service with the militaries of the US, Israel, UK, Netherlands, Saudi Arabia, Egypt, UAE, Greece, Indonesia, Japan, Taiwan, Singapore and South Korea. In addition to India, Iraq and Qatar have also contracted for the Apache attack helicopters. These Apache attack helicopters armed with hellfire missiles will reportedly based at IAF�s Hindon airbase. Indian industry partners like Dynamatics have already been building large sections of Chinook, and Tata Boeing Aerospace Limited is building the complete fuselage of the Apache. Dynamatics Technologies had delivered the first set of aft pylon and cargo ramp assemblies for the Chinook way back in February 2015. 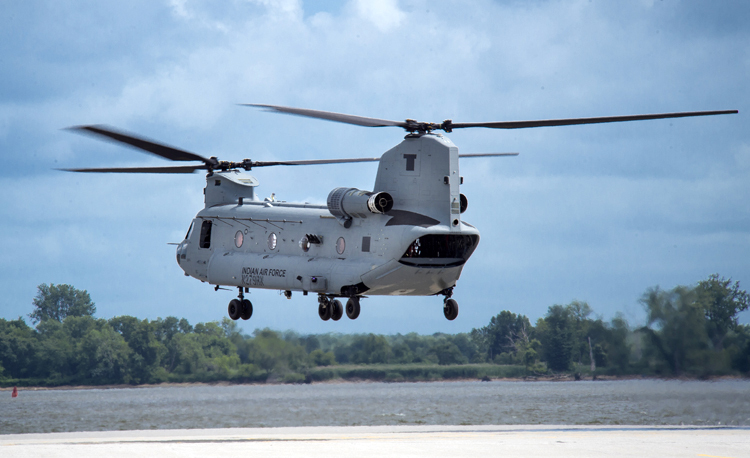 In August 2018, Boeing and Dynamatics Technologies announced delivery of the 75th aft pylon and cargo ramp components for the Chinook. 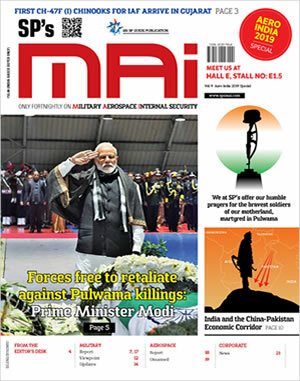 The Indian military till now has been dependent on Russian Mi-17 medium-lift and Mi-26 heavy-lift helicopter for troop induction and Mi-35 helicopters for attacking enemy mechanised columns. Induction of the Chinook and Apache helicopters will be a game changer for the Indian military, these being more agile platforms. The US no doubt is more than satisfied and businessman Donald Trump elated having already bagged contracts worth over USD 10 billion over the last decade and many more deals in the offing.